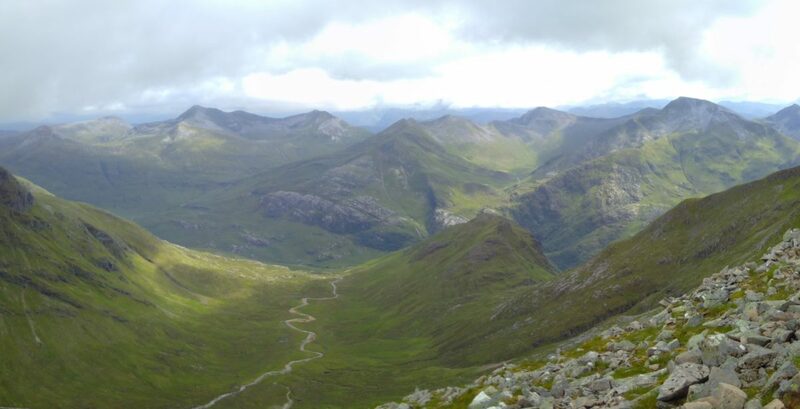 Scotland’s 4000ft-ers are divided into two clusters: five lie in the Cairngorms and four in Lochaber, culminating in Ben Nevis itself above the town of Fort William. 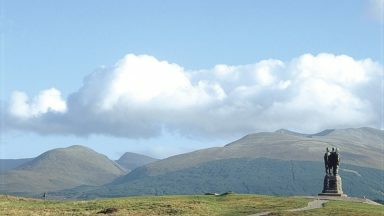 These four peaks are collectively called the Lochaber 4000s. 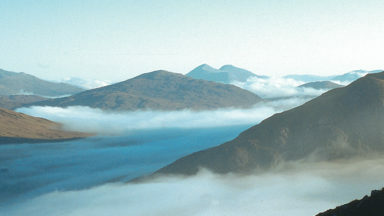 The peaks, in order of height, are Ben Nevis (1345m), Aonach Beag (1234m), Aonach Mor (1221m) and Carn Mor Dearg (1220m). The routes all average out at around 2000m of ascent. 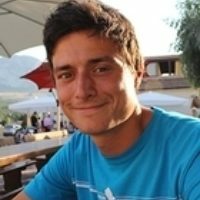 If you have a good level of fitness you should get round in 10 hours. There are four possible places to start. Two involve an ascent of Ben Nevis first, from either the visitor centre or the North Face car park, which gets a major part of the ascent out of the way but has a major disadvantage. I’ll point out what this is later, but for now I’m going to assume you’re walking from east to west, or in other words, starting the day with one of the two Aonachs. The approach from the north, to make Aonach Mor the first peak, is up a long steady slope. The lower part of this slope lies within the realm of the downhill mountain biking centre, or the ski centre in winter. From the car park until the high gondola stop at 650m, be very aware of bikers. Even above this point, ski infrastructure is with you all the way up to nearly 1200m. 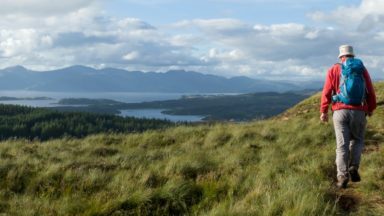 It’s for you to decide whether the steady rise of the slope and the tremendous views back over Fort William and Ardgour are worth this intrusion. If they are, you will soon find yourself on the flat summit plateau of Aonach Mor, where a cairn marks the summit. Head south along a path to reach the bealach, and begin the more exciting ascent of Aonach Beag, admiring the line of the north-east ridge off to the left and feeling happy that you’re not on it. From the summit, return to the bealach. For a wilder experience, approach from the south. 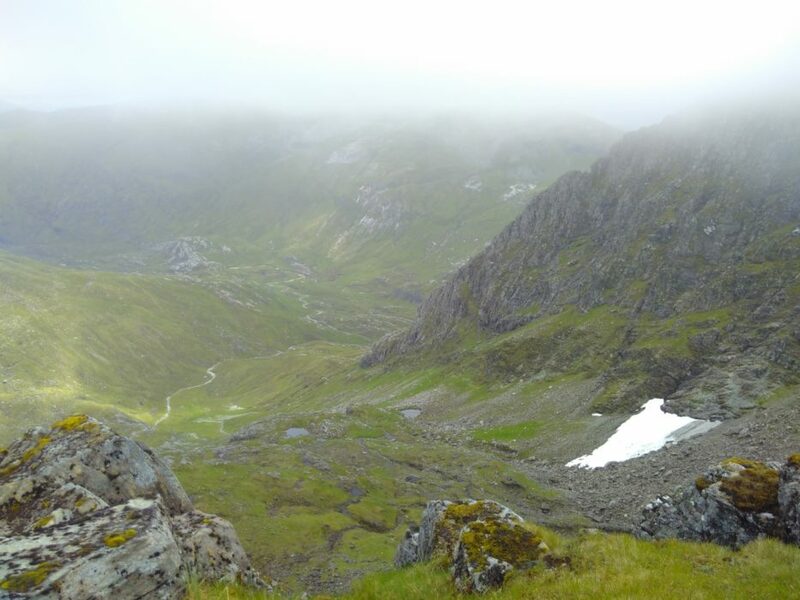 Start from the upper Glen Nevis car park, walk through the gorge, admire the Steall Falls, and cross the Allt Coire Giubhsachan via the footbridge. 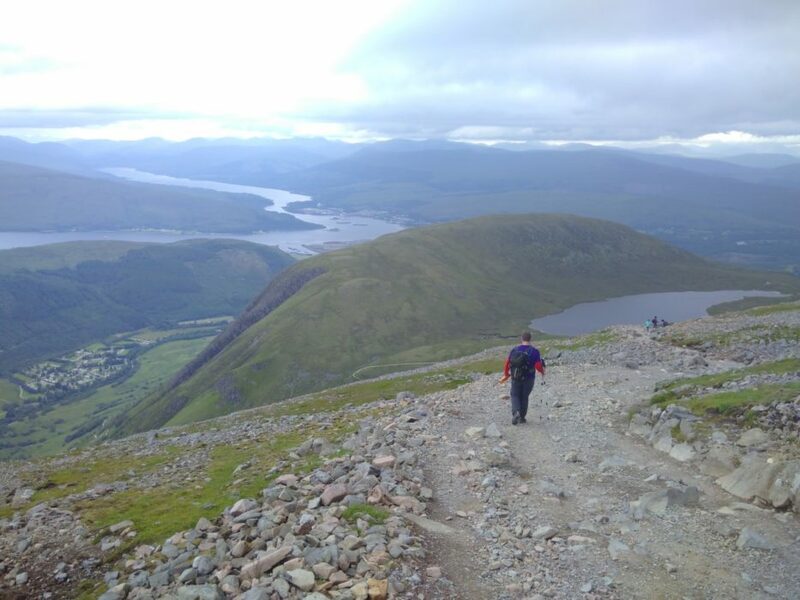 To the north lies the abrupt but fantastic route up Aonach Beag via Stob Coire Bhealaich. If you go this way, summit Aonach Mor second and then return towards the bealach between the two Aonachs. The Aonachs out of the way, descend the blunt ridge that points west towards Carn Mor Dearg. This ridge doesn’t go straight from the bealach, but is on the side of Aonach Mor. 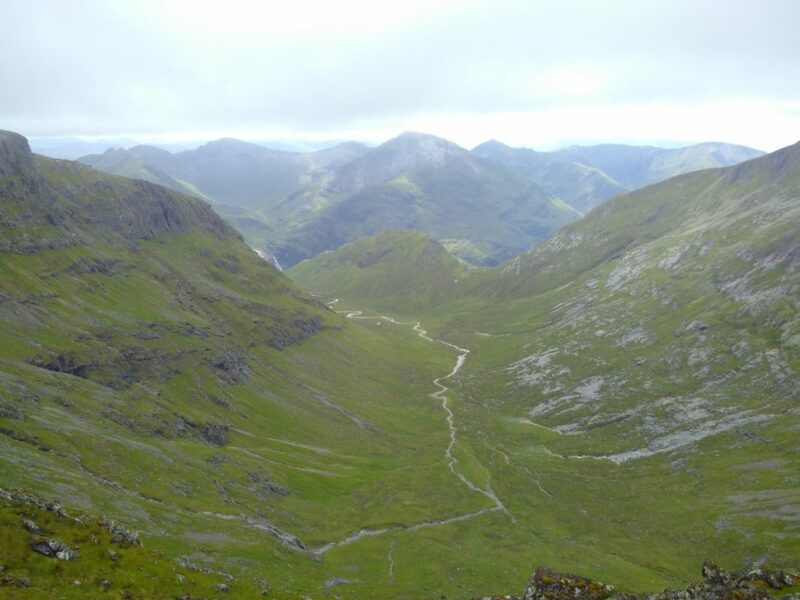 There is a faint path, which quickly turns soily, steep and slippery, and which leads straight down to the bealach at 830m. The route up the other side, to the summit of Carn Mor Dearg, is excellent. The slabby rocks at the start are good fun to jump over, and the final section of ridge is wide enough to be comfortable but narrow enough to see over both sides. You’ll be able to look down at the Steall Falls far below. 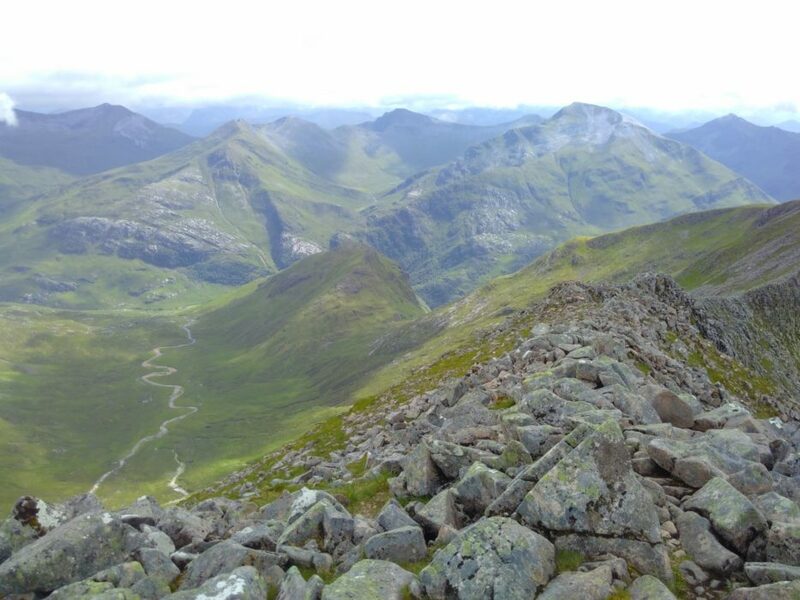 From the summit of Carn Mor Dearg, the great North Face of Ben Nevis is revealed. 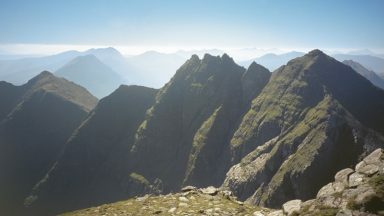 It is for this reason I think the route is better east to west, because now you have the famous Carn Mor Dearg arête as the penultimate section, all the while facing the colossal crags of The Ben. 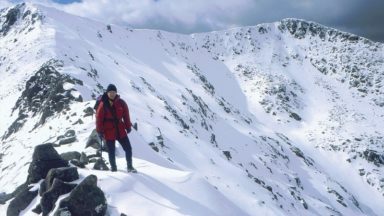 The Carn Mor Dearg arête is an excellent scramble, and is relatively simple. There is no serious exposure, and the few bits that can’t be bypassed on a path are blocky. In other words, you’ll need to use your hands, but the moves are simple. The final ascent up Ben Nevis from the end of the arête is a boulder field, which only relents when the summit plateau is reached. From the summit the descent is via the Pony Path back down to Achintee or the visitor centre. You could also branch off the Pony Path to descend to the North Face car park. 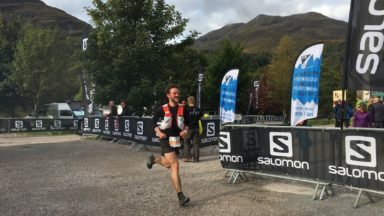 What are the Munros? And why should I climb them?